To make it fit in the average sedan, I considered making it fold like a stepladder, but figured it would spend most of its life assembled and storing other supplies. So I designed it to be constructed in 4 major components, so it can be assembled on site. It can also be assembled with bolts so it can be disassembled easily. This is a minimal build, with only one side covered with whiteboard. Optional features start with covering the other side, which could be anything from another white board, to a magnetic surface, chalkboard, felt, or a combination with a reversible panel. Hooks could be added for large drawing pads, or to hold a spindle for 24″ paper rolls. Map clips could be fastened to hang papers, or cloth pockets attached to the sides. The basic frame includes a shelf in the middle, and rails to hold two layers of plastic tubs. The rails are shown to fit 15″ tubs, but can be adjusted slightly to fit a different size. After cutting both ends at an 11 degree angle (from of a right angle), a second angle needs to be cut at the top of each leg. Measure 1 1/4″ from the obtuse angle across the end grain. From there, make a line perpendicular to the end grain. Cut along that line. 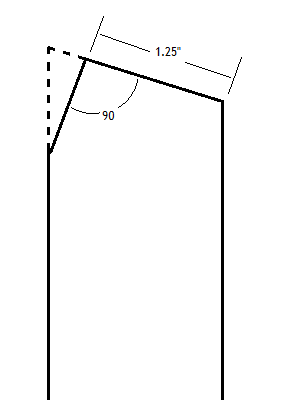 Measure down 36″ from the same obtuse angle and make a mark. Make another mark at 44″. Make matching marks on both legs. Note: the edge on the obtuse angle at the top and acute angle at the bottom is the front edge. Attach the sides together with a 24″ 1×2 spanning them, with the bottom edge aligned on the marks at 36″. The face of the 1×2 should be flush with the front edge of the legs. Glue with finish nails are all that is needed for this piece. Now attach a 1×3 between the legs, directly above the 1×2. This piece should be set back 1/4″ from the front edge of the legs. Use 2 screws on each end, either through the legs into the ends, or using a Kreg jig through the 1×3. This piece is important for structural rigidity. Now attach the top piece (24″) between the legs, flush with the end grain at the top. The edge of the top piece should be 1/4″ back from the obtuse angle. It will stick out 1/2″ on the back. Use glue and one screw on each side. The lower rail, at the 44″ mark, should be installed later. Attach the side supports to the inside of the legs, aligned 1/4 back from the front edge, even with the 1×3. The top will not align exactly with the bottom edge of the top rail, due to the angle. These pieces can be installed with glue and nails, ideally with clamps while the glue dries. The top of each leg needs to be cut the same as the front legs, by measuring 1 1/4″ from the obtuse angle, and making a right angle from the end grain. The same marks are also needed at 36″ and 44″. Use a 1×3 to attach the legs at the 36″ mark, this time aligning the face with the back edge of the legs. Now attach a 25.5″ piece of 1×3 to the bottom of the legs, with the corners aligned to the acute angles. Use glue and 1 screw through the 1×3 into the end grain of each leg. The top piece should have two 1/4″ holes drilled, each one 3 1/2″ from each end. The should be off-center, 1″ from one edge, and 1 1/2″ from the other. Connect the top piece, aligning the edge that is 1 1/2″ from the holes with the obtuse angle. Use 1 screw through the top into the end grain of each leg. Attach the wheels to the bottom rail. The lower rail will be installed later. Starting with the two 22 1/2″ pieces for the sides, drill 1/4″ holes 4″ from one end, and 3 1/2″ from the other end of each piece, centered across the width. Install a 1×3 between them, flat, with the face flush with the bottom edge of the sides, and the edge aligned to the ends of the sides. Install a 1×2 at the other end, also flat. Use glue and one screw through each side piece into the end grain of the cross pieces. Now attach 24″ 1×2 pieces that will serve as the front of each tray, on opposite sides. These can just use glue and nails. 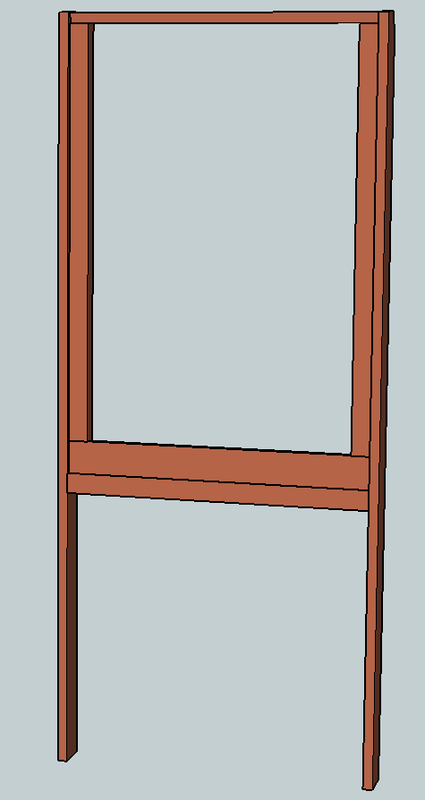 Insert two more 1×2 pieces between the side rails, with the face tilted up at a 30 degree angle. The edge of these pieces should just touche the back edge of the bottom piece, completing the “tray”. Glue and nails are sufficient for these pieces. Install one more center rail between the side rails to support the shelf. This one should get a screw in each end, along with glue. The 23 1/8″ pieces are the sides. A 1/4″ hole should be drilled through each end of the side rails, 7/8″ from the end, centered across the width. Two 22 1/2″ pieces are installed between them, 3 1/2″ from each end. The exact placement can be adjusted to hold different size bins. These should be attached with screws. Assemble the front and back frames with the structure on its side, sliding the top rail of the front frame under the top rail of the back frame.. Keep the feet 24″ apart. Mark through the holes on the top rail, on to the top rail of the front frame. Drill holes in the top rail of the front frame, and insert bolts. Do not tighten yet. Stand it up, making sure the wheeled feet are blocked. 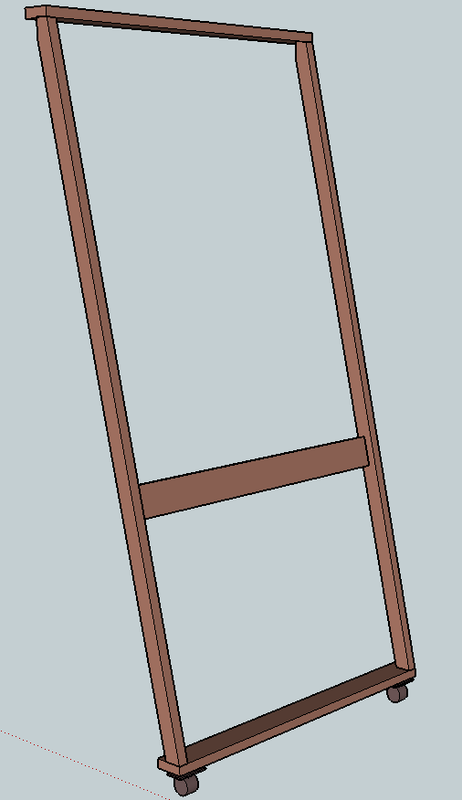 Set the bottom frame on top of the wheel rail, with the ends aligned with the edge of the wheel rail. Mark through the holes into the legs, and drill. Install bolts. Align the front legs so the bottom frame is level, and the bottom corner of the side rails aligns with the edge of the legs. Mark the holes, drill, and install bolts. 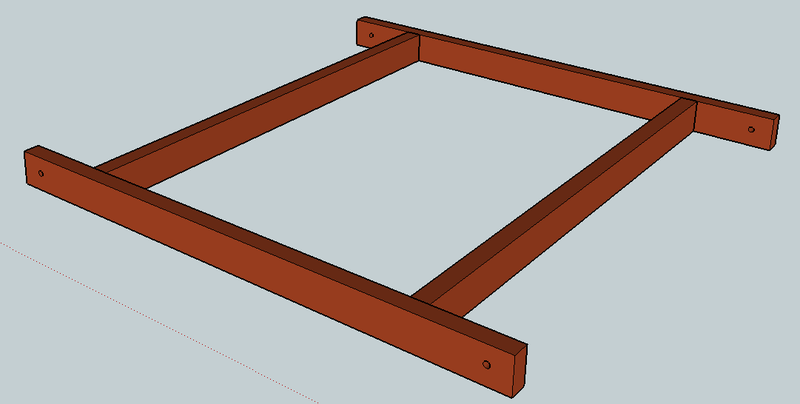 Align the tray under the cross supports. It will stick out 1″ farther on the front than it will on the back. Mark, drill, and install bolts. The whiteboard can be glued into the front frame. One screw could be used in each corner for additional strength. The smaller piece of whiteboard can be nailed or glued to the tray for the center shelf. It will need to be slightly off-center. The lower rails can be installed to hold another layer of plastic tubs. Use the marks on the legs at the 44″ mark, or adjust as needed so that the distance between the inside edge of the two rails is slightly wider than the body of the tubs you will use. Glue and a screw on each end should be used to secure them. If the tubs will hold significant weight, small pieces of scrap 1×2 could be attached to the inside of the legs immediately below these rails for additional support. The bolts can be removed to separate into 4 pieces for transport, and easily reassembled on site. 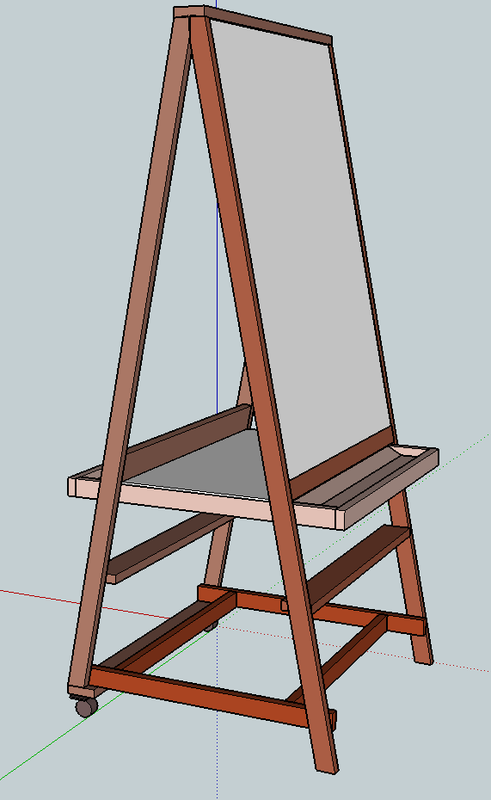 You can also download the Sketchup file and view the parts in detail. I am trying to find the sketchup file, but can’t. I downloaded sketchup but have no idea how to open the file. And it won’t open any skp files. Very frustrating.